The Gift Giving Has Begun! Yesterday morning, I was online, as I normally am on Wednesday mornings. I finished up my live session on my cell phone, and turned to look at my laptop screen. There, in my open social media site, was a highlighted item for sale in my area. 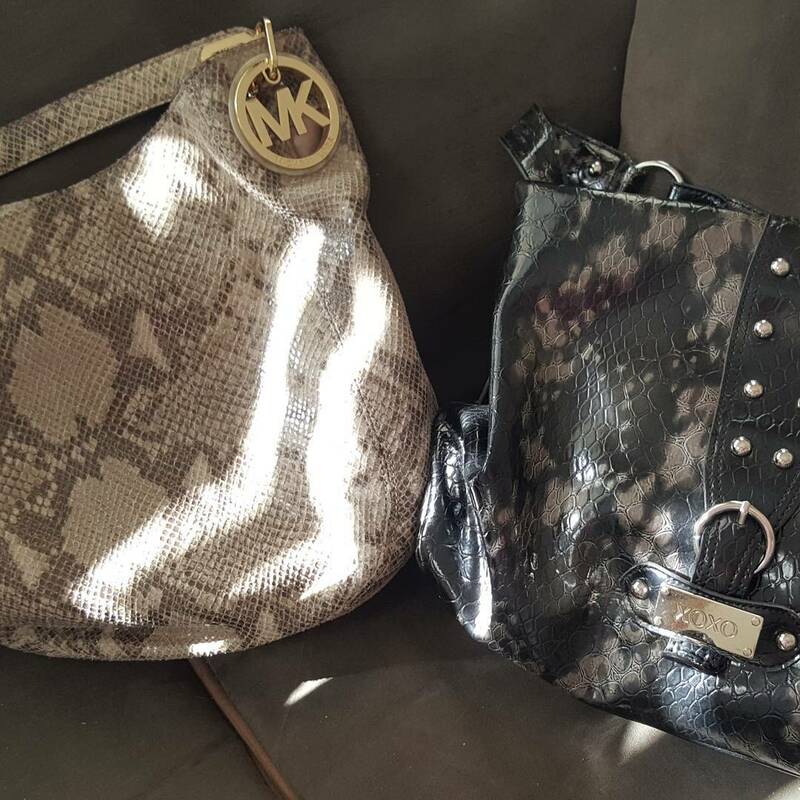 It was a very nice purse – a Michael Kors snakeskin purse. There were two other items for sale with it, but what really caught my eye was this purse, in excellent condition. At the price that it was advertised, I simply couldn’t resist contacting the seller. You see, I knew this was God, answering my prayer. Well, it wasn’t exactly even praying, really… it was a thought process – a “think-prayer”. I have been “think-talking” to the Lord about a new purse for quite some time, because the one I have right now is literally falling apart. I have been using this same, worn out purse for many months, but I really didn’t want to spend the money for a new one. Even generic purses are expensive, let alone designer. As a result, I stopped looking. It seemed like a luxury to me, something that could simply wait. But God…In “think-talking” to Him about a new purse a few days ago, a memory flashed into my brain, just for a split-second. It was a really quick thought about someone I knew, a believer, that had gotten a very expensive designer purse given to her as a gift. In this split-second-flash memory, I “think-prayed” to the Lord, and said in my head, “I would love to have a really nice purse given to me.” That was it. That was the entire thought process. No fancy prayers, no covetousness, just a quick thought…and then I forgot about it. At the price I paid, she “gave” me that purse. I knew it was a gift…an answered prayer, and a gift from God. I told her the entire story, blessed her, and wished her a Merry Christmas. She truly was blessed, and I know she left that parking lot with Jesus dancing in her heart. We both got a gift from God. Thank you Jesus, for your many gifts that you are bestowing upon your beloved in this season. Merry Christmas to you, Beloved! The Gift Giving has begun! Blessings and Abundance, from His heart to yours! Author Edie BayerPosted on November 30, 2017 November 30, 2017 Categories UncategorizedLeave a comment on The Gift Giving Has Begun! Be Completely Satisfied! God knows what you want, why you want it, and He wants to give it to you! Hang in there! Hold on just a little longer, and you too will be “completely satisfied”! He is working to accomplish that very thing for you – to be used in the end-time harvest! He is working for your good on your behalf (see Romans 8:28). He knows what you want, why you want it, and He wants to give it to you! Why? Because He is the one who has put the desire into your heart in the first place! “Delight yourself also in the Lord, and He will give you the desires and secret petitions of your heart,” (Psalm 37:4 AMPC). “Because he has set his love upon Me, therefore will I deliver him; I will set him on high, because he knows and understands My name [has a personal knowledge of My mercy, love, and kindness—trusts and relies on Me, knowing I will never forsake him, no, never]. He shall call upon Me, and I will answer him; I will be with him in trouble, I will deliver him and honor him,” (Psalm 91:14-15 AMPC). I love to ask people, “When you were living in the world did you long to fulfill the purposes of God?” Their answer is always the same – No, not at all! That is because the dreams and desires you now have are HIS desires and HIS purposes that He has placed inside of you, by His own Holy Spirit! Of course He will fill them! Other than praying for salvation, what better prayer for Him to want to answer than asking for the Kingdom to come with healing the sick, raising the dead, restoring blind eyes and deaf ears, with other miraculous signs following? That is what He wants, because it is His Will. When you pray according to God’s own will, then His Will is done! “And He said to them, The harvest indeed is abundant [there is much ripe grain], but the farmhands are few. 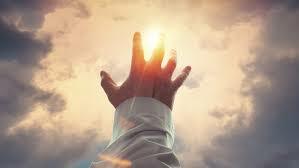 Pray therefore the Lord of the harvest to send out laborers into His harvest,” (Luke 10:2 AMPC). Jesus instructed us to pray for the laborers. I always thought I was supposed to pray for OTHERS to be sent into the fields! In actuality, the laborers are YOU – ME – US – all of us, all asking to be used of Him in the third, great and final awakening! You have prayed this prayer by divine inspiration asking to be a laborer, and He will gladly answer that prayer! He told us to do it, and He will answer that prayer according to His Will! He is leading us and guiding us into all truth by the power of His Holy Spirit (see John 16:13). When we follow Him, He will lead us down paths of righteousness for His Name’s sake (see Psalm 23:3). In fact, according to Ephesians 2:10, we walk in paths He already prepared ahead of time! This good life includes walking in miracles. It includes walking in Kingdom power and authority. It includes being used of the Lord, not just in the end-time harvest, but at all times, in every situation, with everyone you meet. God’s timing is perfect. He will use you at just the right moment, with just the right set of circumstances, with just the right people. Just Follow Him. Be blessed on your path! PS: Before I added this note and the itinerary, there were EXACTLY 999 words in this post. 9 is the number of HARVEST! Author Edie BayerPosted on November 24, 2017 Categories UncategorizedLeave a comment on Be Completely Satisfied! God knows what you want, why you want it, and He wants to give it to you! A NOW Sign NOW in NOV.! 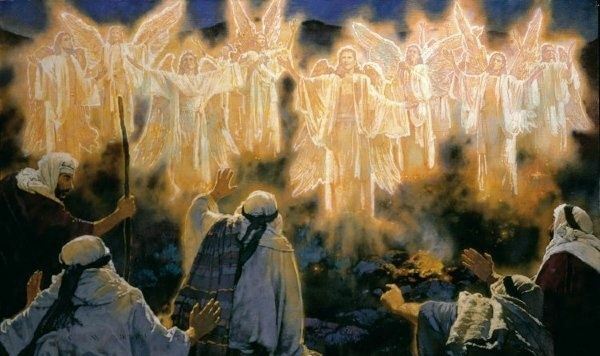 I believe there is an important announcement coming from Heaven, and it’s very soon. In a vision yesterday, Jesus was standing on the edge of a cliff, as far out as He could on the ledge, to get as close to heaven as possible. He was intently staring at the heavens, watching and listening. I tried to catch His gaze, but He didn’t look at me. He just kept listening, and staring at heaven. After a while the people behind him lost interest and started talking, carrying on and making noise. He silenced them with the “SHHHHHH” sign, waving his hand behind Him at them. He never even looked at them. He was rapt, watching and listening to heaven, waiting for a sign, listening for a sound from heaven. He was very intensely, actively waiting for something to occur – a signal. Just last night my husband had a dream of multiple buses headed back home from a resort area. The bus drivers were talking to each other on their radio microphones. They were talking about the fact that the entire northern U.S. was covered in some kind of storm, and the buses had to re-route through the southern states – south of the I-10 corridor, he said. It was going to be a dangerous trip. My husband then recounted a weather report he’d heard about the northern U.S. being much colder than normal this winter, with the southern states being much warmer than normal. I believe my vision and his dream are tied together. The Lord often talks to my husband, and then separately to me, giving him one piece, and me another. I have been looking at the abbreviation for November “Nov.” and the word “NOW”. They are so similar! This has really been highlighted to me over the last few days, and I have felt the weight of the phrase “NOW in Nov.” It keeps rolling through my head, over and over. And in the morning, It will be stormy today, for the sky is red and has a gloomy and threatening look. You know how to interpret the appearance of the sky, but you cannot interpret the signs of the times. A wicked and morally unfaithful generation craves a sign, but no sign shall be given to it except the sign of the prophet Jonah. Then He left them and went away. Interestingly enough, I had already drawn brackets around this verse at some other time, as well. He intentionally had me do that in the past, to bring it into the NOW! That speaks volumes to me! He is giving us a NOW SIGN NOW in NOV.! Even though Jesus is chastising in this verse, He is not speaking to you and I as His disciples. He is not even speaking to believers! He is speaking to Pharisees and Sadducees – those who would NEVER believe in Him. Few of us would disagree that we are part of an upside-down Kingdom. So, since that is true, through this verse, because we know we abide in an upside down Kingdom, He is saying the exact opposite to us. This means, as His disciples, we are NOT a wicked and morally unfaithful generation! He WILL give us signs … and He is NOT leaving! In fact, He is coming back! NOW, that is Good News! Amen and so be it, indeed! Are you a believer, a disciple, working in the Kingdom? Then expect signs from heaven! They follow you! My husband’s dream of the buses was interesting, because buses mean large ministries and churches. The drivers were communicating over the airwaves – by their radios, symbolizing prayer. Their concern was an impending storm that covers the bulk of the U.S. (us – you and me!). This SIGN, a forthcoming storm, was enough to re-route them to go lower, symbolizing humbling ourselves. They were forced to go south of the I-10 corridor, the highway that runs east-to-west from coast to coast, across our entire country. This area and southwards is typically known as – you guessed it – the Bible belt! These “drivers” symbolize the five-fold ministers that have been selected by God to carry His people (on the buses) to their final destination…back to Him. The last part of the vision was incredible, even though it happened at the beginning. I saw a very thin membrane, a thin veil, separating heaven from this earthly realm. It was pregnant, heavy with possibility, bulging and straining to hold back its contents. Jesus did a karate-chop move, slicing the membrane open with His hand, and out tumbled all kinds of TOYS! There were trikes, and games, and toys of all types. The thought hit me, “Toys for Tots”! When this happened, Jesus broke out in a radical “happy dance”! He was so intensely overjoyed! It was after this that He went to the cliff’s ledge to watch for the sign from heaven. So, whatever is coming, whatever this sign looks like, this announcement brings great, overwhelming joy. God’s ways are better than our ways, and His thoughts are higher than our thoughts (see Isaiah 55:9). I still do not know what the sign is that is coming from heaven, this “important announcement” that is imminent. I just know to be watching for this heavenly sign – the Now Sign Now in Nov.! It’s coming soon, maybe even to a prayer closet near you! Author Edie BayerPosted on November 6, 2017 November 6, 2017 Categories UncategorizedLeave a comment on A NOW Sign NOW in NOV.! God is Sending Reformers into our Midst! God is a “picture God”, and speaks to me often in visions. 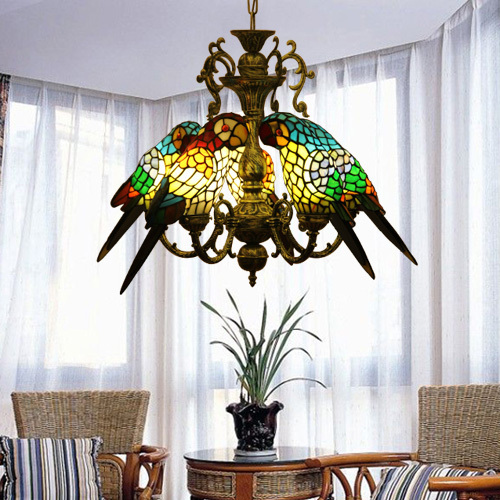 Recently, I had a vision of lamps: lovely, Tiffany-style lamps of all colors. The first had blue, clear and yellow crystal drops hanging around the edges. The Lord instructed me to “pick” a crystal, as one would pick fruit. I went to eat it, but He stopped me, so I held the crystal from the lamp in my hand. He then showed me another lamp, although at first I couldn’t really make out what it was. As I pressed in to the vision, I saw it was another lamp, this time emerald green, on the side of a dirt pathway. This lamp, however, had crystals that were shaped differently: they were curved out from the main base, pointed at the ends, shaped a little like palm fronds, and very obviously cut glass of some kind. The next lamp after it was red and shaped the same way, although the “leaves” seemed to be a little rounder at the bottom, where the green one had pointed tips on the “leaves”. There were several other lamps fading into the distance down this dirt path on the other side of these two. Suddenly he gave me a close up view of a lamp with black and white crystal “leaves”. He showed me the depth of the coloring in the crystals. They reminded me of very pure quartz. These crystals had coloring changing gradually from black to white, then clear along the edges of the palm frond “leaves”. They had a very sharp, cut glass look. The vision ended with people shopping, walking down a cobblestone pathway, like an open air market in another country. SALVATION: The first lamp stands for salvation – the Lord encouraged me to “pick” it! He told me not to eat it, but merely to hang onto it. Jesus said, “He who endures to the end will be saved,” (Matthew 24:13 AMPC). This lamp was shaped differently from all the others, with the salvation crystals hanging from the lamp shade, like fruit. The lamp gave light; however, we are allowed to choose the free gift of salvation by picking it…or not. GROWTH: I had to press in to see the rest of the vision. This is important! Had I not, I would not have seen what God wanted to show. As I pressed in to the vision, I saw the second lamp, or light of revelation: life and growth. It is green, which also stands for “GO”. This is when we begin to want to grow in the things of God, and press in to take an active role in our maturity in Kingdom understanding. We study to show ourselves approved (see 2 Timothy 2:15). We learn basic Kingdom principles, study and memorize scripture, grow closer to God and are hungry for more. At this stage we “eat the word” (see Jeremiah 15:16), which nourishes us and helps us to grow. IDENTITY: The next lamp is red, symbolizing the blood of Jesus. This level of revelation is when we begin to understand that the blood covers us. We align ourselves with and take on HIS IDENTITY, beginning to shed the identity of the world. At this stage, we understand our giftings and offices, and are walking in them. We have a level of confidence in our identity in Christ. We understand our authority, our power, and how to use it. “For [you seem readily to endure it] if a man comes and preaches another Jesus than the One we preached, or if you receive a different spirit from the [Spirit] you [once] received or a different gospel from the one you [then] received and welcomed; you tolerate [all that] well enough!” (2 Corinthians 11:4 AMPC). This is the reason for the next lamp: REFORMATION! Before I could see the next lamp down the path, He showed me a close-up of a BLACK and WHITE lamp. I believe this is the one with which He was most concerned; so much so, in fact, that he showed it to me CLOSE UP, which also means it is CLOSE! It was very sharply cut glass, with very pointy edges on its “leaves”. The colors in the quartz-look crystal were BLACK, WHITE and CLEAR along the edges – there were no gray areas! There is no gray area in the Kingdom, hallelujah! I believe what He is saying is He is clearing up the issues that we, as His people, His body, have had. God is sending Reformers into our midst. On the Five-Hundredth Anniversary of the Reformation, it seems only fitting that God is speaking this! He is sending those who can sharply define what God is doing and saying, clearly, according to His Word, in black and white! He is sending those who have a firm understanding of His will and His ways, including the correct understanding and application of His grace. I believe these that He is sending will clean up the messes left behind from faulty doctrines we have come to learn along the way. This will eliminate the “other gospel”, and get His people back on track, ready for the next level of revelation. He loves us too much to leave us where we are, so He is sending correction! He chastises those He loves! “For the Lord corrects and disciplines everyone whom He loves, and He punishes, even scourges, every son whom He accepts and welcomes to His heart and cherishes. You must submit to and endure [correction] for discipline; God is dealing with you as with sons. For what son is there whom his father does not [thus] train and correct and discipline? Now if you are exempt from correction and left without discipline in which all [of God’s children] share, then you are illegitimate offspring and not true sons [at all],” (Hebrews 12:6-8 AMPC). There were other lamps in the distance on the pathway, the dirt pathway, upon which we walk this walk. These lamps still await us in the distance, more light, more revelation waiting to be revealed. I believe some of us may have to get past the REFORMATION period before we can reach these other levels of light and understanding. It is also why our shoppers at the end of the vision were walking on a cobblestone walkway – it is a firm foundation, in order, and easy to walk upon. He is clearing the path for future harvest – for those who will be “picking” salvation in the future. For the rest of us, He will reveal all at the proper moment – in God Time. Author Edie BayerPosted on November 4, 2017 Categories UncategorizedLeave a comment on God is Sending Reformers into our Midst!